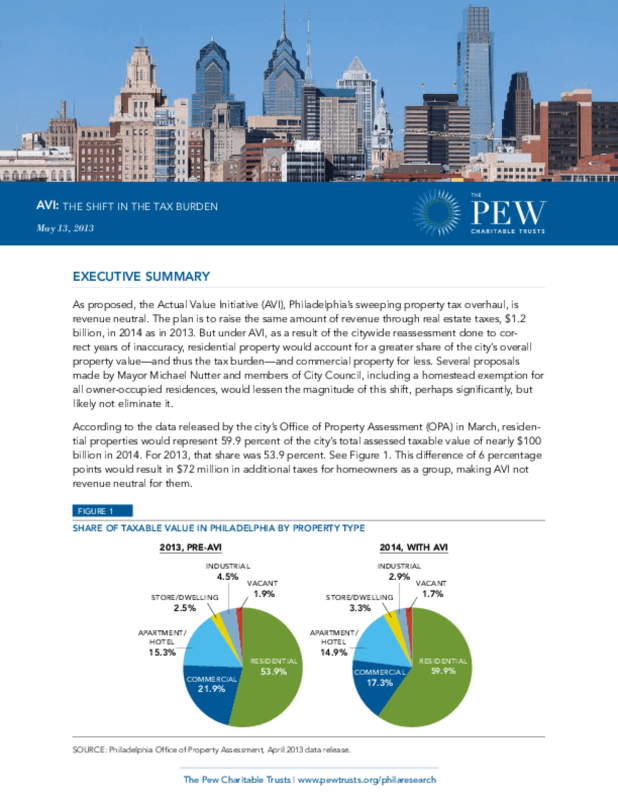 As proposed, the Actual Value Initiative (AVI), Philadelphia's sweeping property tax overhaul, is revenue neutral. The plan is to raise the same amount of revenue through real estate taxes, $1.2 billion, in 2014 as in 2013. But under AVI, as a result of the citywide reassessment done to correct years of inaccuracy, residential property would account for a greater share of the city's overall property value -- and thus the tax burden -- and commercial property for less. Several proposals made by Mayor Michael Nutter and members of City Council, including a homestead exemption for all owner-occupied residences, would lessen the magnitude of this shift, perhaps significantly, but likely not eliminate it. According to the data released by the city's Office of Property Assessment (OPA) in March, residential properties would represent 59.9 percent of the city's total assessed taxable value of nearly $100 billion in 2014. For 2013, that share was 53.9 percent. This difference of 6 percentage points would result in $72 million in additional taxes for homeowners as a group, making AVI not revenue neutral for them.